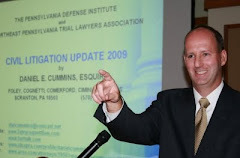 According to a May 5, 2010 Times Leader article by Terrie Morgan Besecker, Federal Middle District of Pennsylvania Judge Edwin Kosik has set down a July 23, 2010 sentencing date for former Luzerne County Judge Michael Conahan. Conahan recently entered into a plea agreement pertaining to one conspiracy to racketeering charge, which implicates the federal honest services fraud statute. The hope is that the United States Supreme Court will issue a ruling on the validity of the federal honest services fraud statute prior to the sentencing date. The statute provides that a person commits the crime of honest services fraud if the person engages in a scheme or artifice to defraud that would “deprive another of the intangible right to honest services.” The statute is currently under attack as being vaguely worded and, therefore, unconstitutional. It is expected that the United States Supreme Court will issue its ruling sometime in June. The need for this Supreme Court ruling has also been the cause of delay in terms of a sentencing date for former Judge Michael Toole, who pled guilty to a fraud charge that also implicates the federal honest services fraud statute. Presently, Judge Toole has a sentencing date of June 24, 2010.